Check out this gently-used 2016 Mercedes-Benz GL we recently got in. This SUV is a great example of beauty and brawn with classic styling and a workhorse power plant. 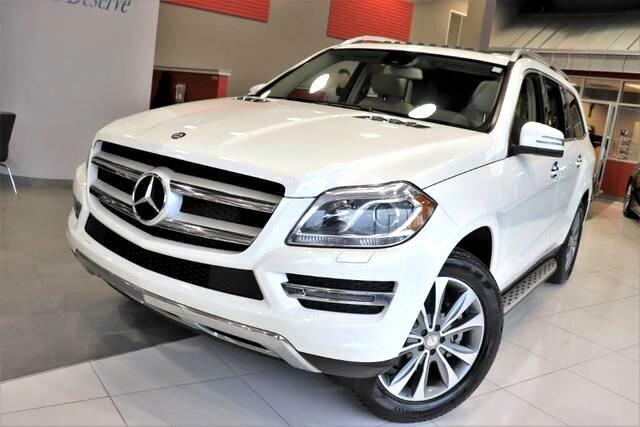 Sophistication & understated luxury comes standard on this Mercedes-Benz GL GL 450 4MATIC - V6 Bi-Turbo Engine - Prem Pkg -. Well-known by many, the GL has become a household name in the realm of quality and prestige. This AWD-equipped vehicle will handle beautifully on any terrain and in any weather condition your may find yourself in. The benefits of driving an all wheel drive vehicle, such as this Mercedes-Benz GL GL 450 4MATIC - V6 Bi-Turbo Engine - Prem Pkg -, include superior acceleration, improved steering, and increased traction and stability. This low mileage Mercedes-Benz GL has barely been touched. It's the next best thing to buying new. More information about the 2016 Mercedes-Benz GL: The Mercedes-Benz GL-Class is a step larger and roomier than most other luxury crossovers as it has three rows of usable seating, but it does compete directly with a set of vehicles that includes the Audi Q7 and INFINITI QX56, as well as the Cadillac Escalade. Among these, the GL-Class stands out for being less truck-like in look and feel, with a more refined ride. The set of luxury features on offer in the GL-Class is also stronger than most in this class, with some of the same advanced-tech items that wow in Mercedes-Benz' S-Class flagship. The fuel-efficient, clean-diesel GL350 BlueTec is a major highlight. It manages to get up to 26 mpg yet with little performance penalty. Strengths of this model include brawny engines, Tough, yet luxurious styling, fuel-efficient BlueTec diesel, three rows of seating, smooth ride, and leading-edge safety-tech features No Credit / Bad Credit / No Paystubs, No problem !! ! All Approved ! Everyone drives ! CLEAN, GORGEOUS, LOW MILES, SHOWROOM CONDITION. CALL NOW QUALITY CERTIFIED up to 10 YEARS 100,000 MILE WARRANTY , To Certify a vehicle, there will be an additional cost for Certification. CALL NOW For details. STUNNING AGGRESSIVE LOOK ON THIS BEAUTIFUL--Call today to schedule a test drive... Good Credit/Bad Credit/No problem!!!! Get paid cash? No problem!! 100% Credit Approval with interest rates starting at 2.49% for qualified customers, our rates will not be beaten. We price our cars at wholesale price to guarantee the best deals for our customers. Our inventory moves quick, please call to confirm the availability of the vehicle of your interest Springfield location 973-564-0112. This vehicle is located at our SPRINGFIELD location. Come visit our new showroom in Springfield NJ.